Is there another state with a Student Technology Conference? Does your conference have 1,000 students and staff attending? Does your conference have all 1,000+ students and staff in one auditorium all on wireless access? 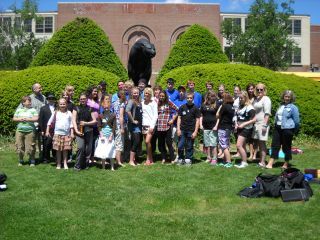 Well, in Orono, Maine, on May 27, 2010, at the University of Maine I attended such a conference. First of all, our students are committed to this project! All of our students in Wells, Maine, had to get out of bed and to the school bus by 5:15 AM for the 3 hour bus ride to Orono. They all had planned their presentations with their teachers and then practiced for 2 weeks. Once at the University, they all attended the opening session, then walked quickly across campus to a variety of classrooms and within 10 minutes they were on stage, confident and presenting to students and teachers from around the state. The rest of the day consisted of another set of student presentations, lunch on campus and then a closing session which captured the essence of the entire conference. Prior to our arrival, all of our students were asked to bring a can of food for our state foodbank, or a dollar donation which would turn into $12.50 for purchases by the foodbank, to support Maine's own Good Shepherd Food Bank. During the Conference day our Maine students and teachers raised 100 lbs of food and $500 in cash. While this was a great gesture it was multiplied ten times at the closing Uber session. Isn’t this is the kind of learning we want for all our students? Don’t we want all our students to be teachers. Don’t we want all our students to share their love of life-long learning. Don’t we want our students to know how to collaborate and solve world problems? Share with us what is happening in your neighborhood? "Please be sure to check out the press and the links that demonstrate the statewide support we have for our laptop and learning program. Also, I love the comment from D_Electrician, who left the comment on the WCSH TV posting of the Student Conference Press Advisory on May 26th!" The laptop program has been validated thousands of times over. Every laptop handed out is a form of validation. The generations coming up will know more about computers and technology than experts did 5 years ago. I'm pretty conservative when it comes to opinions on state spending and bogus programs. This isn't a bogus program. Computers put the power of knowledge and information at the hands of the students. And a side note, the salary of 3 or 4 technicians combined doesn't even reach half the pay grade of a Maine politician." for all teachers grade 7 to 12.